Papa Wheelie Reviews Jorge Lorenzo’s big win at the MotoGP Spanish Grand Prix. It’s a little belated, but you can blame Jobu for that. With only a slim lead in the championship heading to the Spanish circuit of Cataluñya, Jorge Lorenzo started the weekend looking to pull out a bigger advantage over Casey Stoner and the rest of his championship rivals. Stoner, as always, looked very, very quick right out of the box but Honda has been struggling with more and more chatter problems in the last few races. Cataluñya is notoriously difficult on tires, and usually is blistering hot during race weekends. This weekend was no exception, but as has followed suit with F1; Race weekends have had a few other surprises in every session. 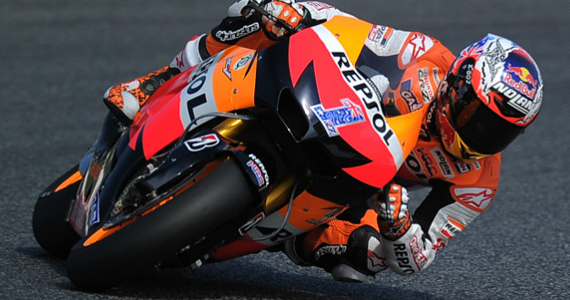 Dani Pedrosa and Casey Stoner made quick progress in the free practice sessions to establish their pace and could have easily spelled certain doom for the field in this very fast circuit. Jorge Lorenzo and Ben Spies were close behind throughout the sessions and show that the Yamahas are very quick throughout the corners. Tech 3 riders Cal Crutchlow and Andrea Dovizioso continue to prove just how close they are to the factory bikes, despite having different spec Yamaha M1s. Ducati’s Nicky Hayden and Valentino Rossi once again struggled to keep pace in the blistering hot practice sessions, but are showing progress in closing up to the front with the diabolic Desmosedici. The race was dynamite right from the go. After he claimed pole, the cooler conditions at race time proved to be a disadvantage to Casey Stoner, and helped out all of the Yamahas, which elected to run the softer rear tire for the race. Dani Pedrosa and Ben Spies got the jump on the field going into the first corner, and both bikes looked like they were destined to have an epic battle for the front. Unfortunately Spies’ bad luck got the best of him again with a costly error that caused him to crash early on in the race. He did recover and managed to come all the way back from dead last to a top ten finish. 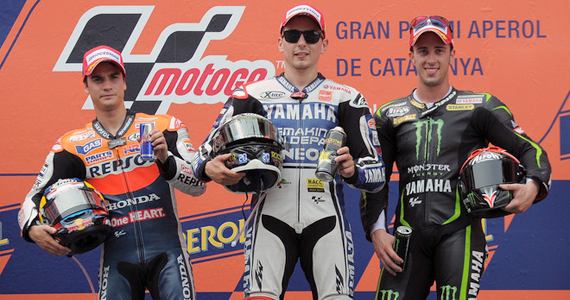 Cataluñya ended with a serious duel from Pedrosa and Lorenzo. Although extremely fast out of the corners and in the main straight, Pedrosa seemed to struggle with corner entry and speed through the corner. But the nimbleness of the Yamaha and Lorenzo’s uncanny ability to control tire wear allowed him to pass at a crucial moment and hold on to the lead until the end. Two wins in a row for Lorenzo means a slight gap has formed between him and Stoner, but Stoner has openly admitted that this weekend has been tough, and so were the tests following it as well. Both Honda riders claim that the new spec Bridgestone is favoring the Yamahas, and it shows, with their complete dominance of the times sheets in Aragon and Cataluñya. Although still down on power to the Hondas, Yamaha has found something over these past few races and has closed up the field to the Repsol Hondas. We’ll see if that advantage stays in a week’s time in at the Grand Prix of Great Britain at Silverstone.